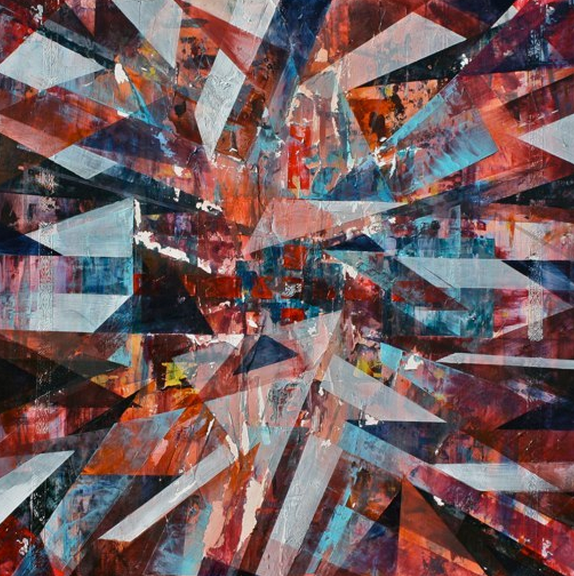 The artistic journey of artist ShawNShawN is one that has been molded by travel, culture and class systems. "My journey started with traveling at a young age. We moved from city to city, state to state and finally country to country. Traveling all over Europe and the US leaves a mark of a self-made gypsy, always moving and reacting to the local scenes I find myself in, recreating my self to various classes, cultures and states. In high school I lived in some dangerous neighborhoods that led to a cynicism of police and justice as I witnessed rich neighborhoods constantly cared for while in poorer neighborhoods the citizens were the enemy similar to what is happening right now in Fergusen, Missouri." ShawN's adventures read like a history book. From the 92' riots in LA to the fall of the Berlin Wall, he has witnessed history unfold before his very eyes. "While living in Poland I was exposed to the fall of the Berlin Wall, leaving its mark on the evil of dictatorship over the citizenry, police states and the fallacy of big government gone astray on a large scale: food shortages, currency boom and busts, scams, constant burglaries and state corruption. Later, I lived in Spain, which had survived 50 years of Fascism thanks to the Allies deciding not to overthrow Franco after beating Mussolini and Hitler. Spaniards were in the moment celebrating the first decade of freedom after lifetime of dictatorship. I witnessed students block 5 lanes of traffic to petition the government to change school policy and other riots. I actively participated in the National Strike, where everyone literally closed shop and demonstrated before police in full riot gear." ShawnShawn watched as Europe rose like phoenix from the ashes, both socially and financially. "Later I lived in Germany in the late 1990s. Here I was witnessing the prolonged techno parties and raves, which got their start after the fall of the Berlin Wall. In Belgium, I studied my MBA in Marketing right as the Euro was being born. Here I learned to study many hours more than in my BA. It truly was grueling work with small pleasures." In 2000, ShawN returned to the US and settled in California. "I decided to move to California to ride the Dot Com rush in 2000. Here I saw the collapse of dotcoms over night and the panic of workers as their wealth evaporated overnight. This truly was a place of dreams and broken dreams." 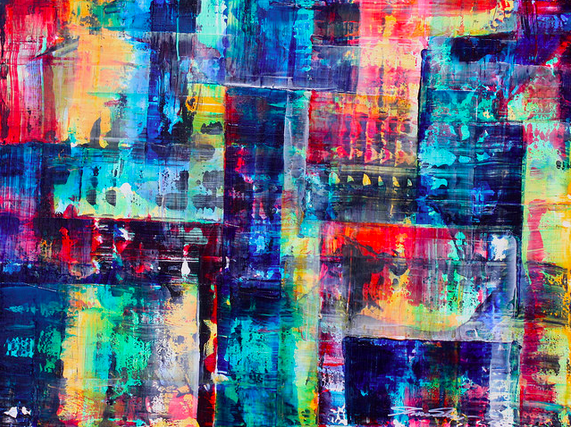 When ShawNShawN began painting again, he turned to eBay to generate interest and sales. "First I sold on eBay to get started, selling over 35 works online. It was a great experience to get started in the art world once again before moving on to gallery sales." His work knows no boundaries. He is an experimental artist who has enjoyed working with various styles to grow as an artist. "I first started forming my abstract styles: Free Form and Architectural Abstraction. In free form abstraction, I experimented with metal tools to capture the essence of the paint and pain in the same moment. In Architectural Abstraction, I moved from pure angular work to a very settled systematic angular painting style. From one art show by Augustine Kofie, I was greatly influenced to change from free form angular to my new style Architectural Abstraction based on 30, 90 and 60 degree angles. Along the way, with my background in history and living history, I started my third style: Political Pop. This style takes on large political ideas: freedom, political repression and popular icons from Hollywood and the world in paint. One of my major influences here was Shephard Fairey as well as Mr. Brainwash after seeing “Exit through the Gift Shop”. I look forward to exploring this style as new ideas come to me regularly." We were thrilled to not only have ShawNShawN's work featured in our LA show, but also to have him at the show. He is an artist who puts no barriers between him and his audience. He signed and handed out some of his prints during the show and attendees loved it! To learn more about ShawNShawN and his work, you can check out his website, Flickr and Instagram.